Student artist Justin Kondrat and faculty advisor Marcia Eames-Sheavly. Preparations began in December when volunteers planted 13,000 flower bulbs in 350 pots and moved them into a cooler to simulate winter chilling. 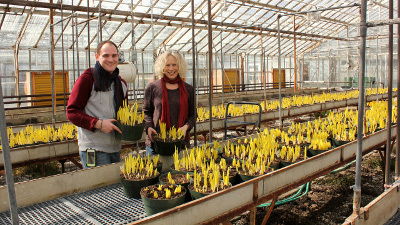 On March 25, student artist Justin Kondrat and faculty advisor Marcia Eames-Sheavly moved the pots to the greenhouse to speed up growth. When the bulbs are in full bloom in mid-April, volunteers will move the pots to Libe Slope below McGraw clock tower and spell out ROOTED in 10-foot-tall letters. ROOTED celebrates the diversity of ways people on campus stay rooted in their lives and in our community. View the ROOTED preview video. 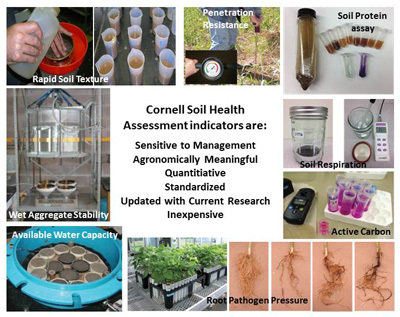 The Cornell Soil Health Testing Lab is open for business for 2014. The lab’s Soil Health Assessment Package includes two new tests this year: Soil respiration and soil protein. The package is tecommended for conventional grain and forage crops, vegetable production, organic crop production, home gardens, and urban gardens. Non-agricultural applications include problem diagnosis in landscaped areas, site remediation, and other urban applications. Additional tests offered include potentially mineralizable nitrogen, soluble salts, heavy metals, and boron. Tests can also be ordered ‘à la carte’. For more information, visit the Cornell Soil Health website. 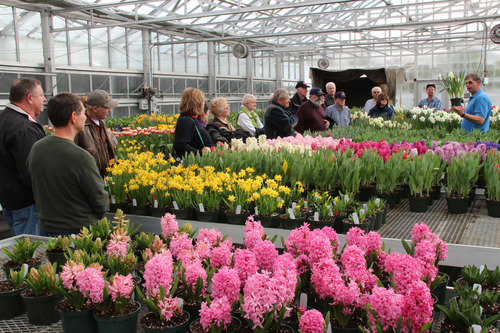 Bill Miller explains flower bulb research to Oregon farmers. The Cornell University Agricultural Experiment Station (CUAES) recently hosted over two-dozen farmers and producers from Oregon who visited Cornell as part of an agricultural education tour of New York State. The tour, sponsored by the AgriBuisness Management Program of Chemeketa Community College in Salem, OR, started with an overview of the energy efficient growth chambers in Weill Hall given by Nick Van Eck, growth chamber supervisor. The tour continued to the greenhouse complex, where Neil Mattson, associate professor of horticulture, showed off spring trials being conducted as part of his research comparing the efficacy of organic vs. conventional fertilizers in the production of bedding plants and vegetable transplants. Mattson also noted that controlled release fertilizers and slow release organic fertilizers can be an effective way to reduce nutrient leaching to the environment. Elsewhere in the greenhouses, Bill Miller, professor of horticulture and research director of the Cornell Flower Bulb Research Program, demonstrated how the growth regulator ethephon helps to keep flowering plants like hyacinths and daffodils shorter and stockier so they hold up better during shipping and sale (pictured). Other presenters included Department of Horticulture faculty members Ken Mudge and Marvin Pritts, CUAES Director of Operations Glenn Evans, and James Tanaka of theCornell Small Grains Breeding Project. 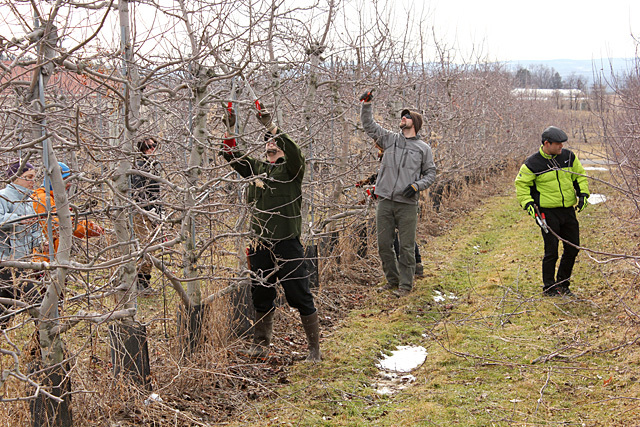 Society of Horticulture for Graduate Students (SoHo) spent a chilly but not totally unpleasant Tuesday afternoon pruning apple trees at Cornell Orchards. The Cornell Orchards retail store remains open 8:30 a.m. to 5 p.m. Tuesday through Saturday. If you missed Ted DeJong’s seminar on Monday, Peach tree scion vigor is physiologically linked to the xylem anatomy of the rootstock, it’s available online. A new study reports that children in schools with vegetable gardens got 10 minutes more of exercise than before their schools had gardens. To get schoolchildren moving, uproot them from classrooms into school gardens, concludes a two-year Cornell study of 12 elementary schools in five New York regions. By experiment’s end, kids at schools with gardens were moderately physically active at school for 10 more minutes a week than before their schools had gardens. That was an increase of four times what peers experienced at gardenless schools. 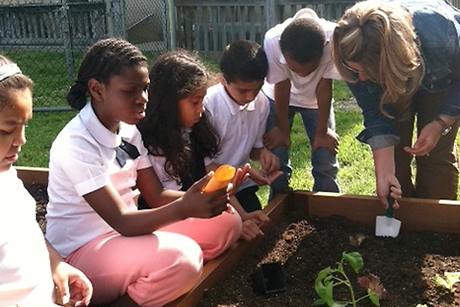 What’s more, children who gardened at school were substantially less sedentary at home and elsewhere than their counterparts. With nearly one in three American children overweight or obese, school gardens could be a simple, low-cost way to get kids more active, said environmental psychologist Nancy Wells, associate professor of design and environmental analysis in Cornell’s College of Human Ecology. 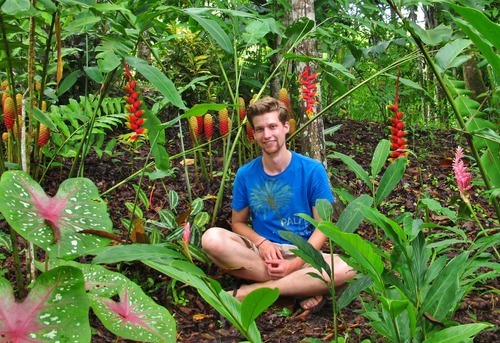 Plants are Matthew Bond’s passion. And at Cornell, this senior and Plant Science major has found plenty of opportunities to pursue his passion. Although he was accepted to Cornell as a freshman, Matthew decided to spend his first two years as an undergraduate at SUNY Potsdam, closer to his home in Ogdensburg, NY. As a Biology major there, he had the opportunity to pursue independent research related to plants and plant chemistry, which deepened his interest in the work and solidified his conviction that Cornell was where he belonged. Read the whole feature at CALS Notes. 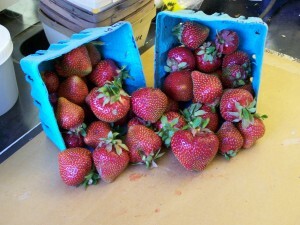 Test-drive a possible new strawberry variety! On behalf of Dale Ila M. Riggs, President, NYS Berry Growers Association and Dr. Courtney Weber, NYSAES Small Fruit Breeder via the Cornell fruit news and events blog. Two years ago, the NYS Berry Growers Association and Dr. Courtney Weber from Cornell’s Small Fruit Breeding Program entered into an agreement where members of the Association will be able to “test drive” advanced selections from Courtney’s breeding program. This is a phenomenal opportunity for all members of the Association and will make it possible for members to try potential raspberry and strawberry varieties before any other member of the grower community has the opportunity. This is a huge competitive advantage! The NYSBGA and Courtney are now seeking growers that want to evaluate and provide feedback regarding the second advanced selection from Courtney’s strawberry breeding program under this agreement. The selection, NY01-16,is very large for the early mid-season. The largest fruit were 51 g (almost 2 ounces) without irrigation. Subsequent fruit hold their size well. The fruit have very aromatic flavor, are slightly dark red, firm, with an attractive conic shape. In 2013 it started fruiting on June 4 (one week prior to Jewel) and fruited until about July 1. If you would like to trial this selection, you must be signed up as a member of the NYSBGA by April 1. If you are not a member, contact Paul Baker, Executive Secretary for the NYSBGA (716-807-6827) to get signed up. You can also download a membership form from http://www.hort.cornell.edu/grower/nybga/MembershipBlank.pdf. After your membership has been confirmed, Paul will need your address, your shipping address, and your requested date for shipment. As part of the evaluation process, a one page site report form and a one page fruit/plant evaluation form will be submitted to the Berry Growers Association and the data will be forwarded to the Small Fruit Breeding program. This is a wonderful opportunity brought to you by the NYSBGA and Cornell. Cornell is excited about being able to get data to see how advanced selections perform in commercial situations. Members can get a minimum of 1000 plants to a maximum of 2000 plants to test on their farm. Don’t miss out. Contact Paul Baker today! If you missed Marcia Eames-Sheavly‘s seminar Creativity in Horticulture Teaching and Extension on Monday, it’s available online. See also our Art of Horticulture YouTube playlist. Associate Professor Jane Mt. 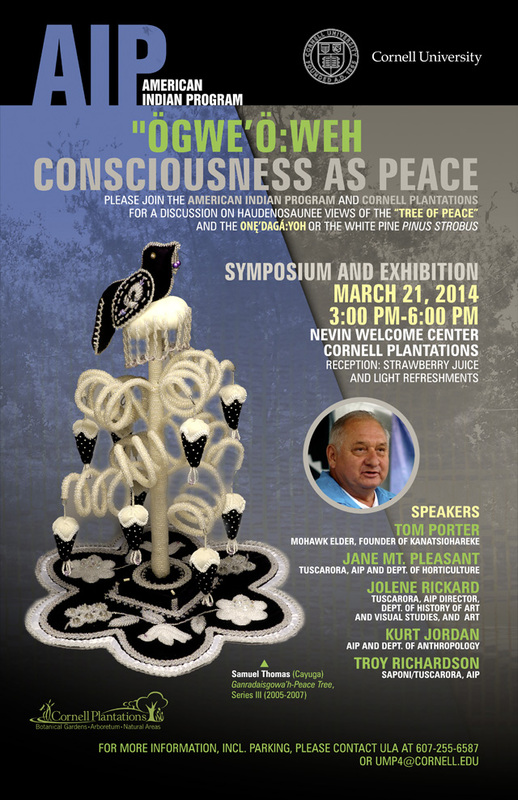 Pleasant will be one of the speakers at a symposium on the Haudensoaunee symbolism of “The Tree of Peace” and place-based foundations of indigenous science, March 21, 3 to 6 p.m. at the Nevins Welcome Center, Cornell Plantations.